The version on mitnse.com is the most accurate, and as you can tell in many parts different to the version that appeared here on Jason’s blog. This post is not keeping track of or explaining events after Mar 12. Events kept developing, and many people keep sharing their discovery with me that one is always smarter after the fact. NHK also reports elevated radiation levels around Fukushima prefecture. At Fukushima City, 65 km northwest of the plant and well outside the evacuation zone, authorities reported levels as high as 13.9 μSv/hr (0.0139 mSv/hr), according to the broadcaster. That is well above the background, and equivalent to 120 mSv/yr in rough terms, but it will only pose a threat to human health if it continues for a long period of time (see this post for more about the numbers). NHK television was reporting .08 mSv/hr at 25 kilometres west-northwest of the site today. A back-of-the-envelope calculations makes that 700 mSv per year (simply: .08 mSv x 24 hours x 365 days).That is a serious dose, but not as bad as it initially sounds. For one thing, the radiation coming from Fukushima seems to be sporadic, so it won't stay at .08 mSv/hr for a long time. Additionally, you would only see the effects of that radiation if you were standing outside for a whole year. More realistically, people will take cover to the greatest degree possible, reducing their exposure considerably. On top of that, iodine tablets and simple precautions for those outside (such as covering up, and removing clothing when moving indoors) will help a great deal. In this context .08 mSv/hr probably isn't much to worry about, though it may become an issue for rescue workers outside for long periods. As I mentioned, in Tokyo, Japan's science ministry reported average rates of .000144 mSv/hr yesterday afternoon. That's double the background rate, but should residents of the capital be worried? No. The horror of Friday 11 March's earthquake and resulting tsunami near the east coast of Honshu, Japan, soon gave way to widespread panic as explosions rocked the Fukushima nuclear power plant. However, one community in the blogosphere seemed to be more measured in response to events unfolding at Fukushima – science bloggers. 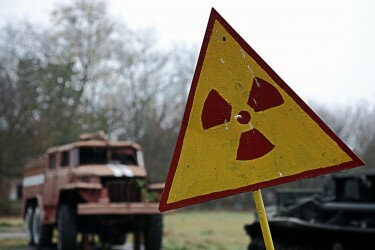 Comparisons have been drawn between Fukushima and Chernobyl already, although science bloggers have advised restraint. Image by Osakabe Yasuo, copyright Demotix (04/06/2009). Science bloggers continue to have a nuanced conversation about the merits of nuclear power. Leading the discussion are Scienceblogs.com's Mike the Mad Biologist and James Hrynyshyn. Both bloggers step away from the hyperbole in the current coverage and try to compare the benefits of nuclear power to other steps societies could take to increase energy supply and decrease demand. An that post calls for reflection but that moves me in the extreme. Can I just point out that Dr. Oehmen is lying when he says that his blog entry is being republished and edited by “Nuclear Science and Engineering Blog at the Massachusetts Institute of Technology.” That is an outright fabrication! http://www.mintse.com is a private domain and completely unaffilialted with MIT despite a header description that purports it to be an MIT website. It is a private website hosted by a private company and only registred as a domain a couple of days ago, clearly to provide more false legitimacy to Dr. Oehmen’s blog entry after the withering criticism. This is an attempt at fraud and should be noted as such. Instead, we have articles all over the web saying that this is the “official MIT Nuclear Science and Technology Department” position on the issue. Hi nhr – I have verified that Dr. Oehmen’s highly edited (one might say “re-written”) post is indeed published at an MIT blog. The blog is new, and maintained by students there. I notice that the URL in your comment has a typo – this may be a source of confusion. I also note that the URL http://web.mit.edu/nse/ resolves to http://mitnse.com – this may also be a source of confusion since the .com extension isn’t something you often see from educational institutions. I am quite familiar with MIT’s online presence and web.mit.edu is their commonly used address – if you’re being directed to the .com address it’s because the University wants you to go there. He is referring all inquiries to MIT’s public affairs department and they are saying Dr. Oehmen is not giving interviews at this time. hello David, i read your post. then can i explain more in detal as a Japanese scientest ? as you know, we had a history, but i think this event won’t go on its same as nuclear bomb. and we also think \inconceivable\. my opinion is that event cleary cause nature. look at fukushima-prefecture, it occured little meltdown, i mean deformation of core. nothing occur core’s expolusion( also spreading of a part of fuel) likely Chernobyl. that is why i think there is some differences between fukushimas’ event and Chernobyl(also hiroshima,nagasaki). however fukushima reactors lost cooler systems, its still keep the soundness of vessel now. it said ”stop the hysteria”.